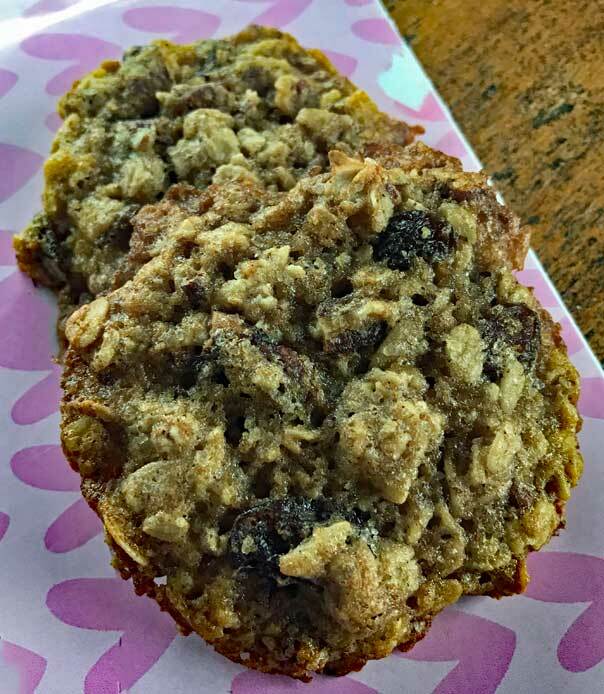 Because you can’t have too many oatmeal cookie recipes, here’s a thin oatmeal cookie recipe from Newsday’s Sylvia Carter who wanted something “less robust” than the Quaker recipe. This recipe appeared in The Lincoln Journal Star. In the article Sylvia mentions that they are supposed to be similar to Normal Rockwell’s favorite oatmeal cookies. I did a little digging around and found a typewritten version of Normal Rockwell’s recipe. It calls for only 1 stick of butter, which doesn’t seem like enough for a cookie with 1 1/2 cups of sugar. Maybe Rockwell played with the recipe because there’s another Normal Rockwell cookie which is similar but doesn’t have the water and calls for 3/4 cup butter and only 1 cup of oats. So this recipe is a bit different, but good if you like a thin cookie that’s not so sweet. For a chewier, sweeter thin cookie, I recommend these Chewy Oatmeal Cookies. These thin oatmeal cookies adapted from a recipe by Sylvia Carter of Newsday. They are chewy rather than crisp and raisins are optional. Using an electric mixer, beat the butter and sugars until creamy. Add eggs, vanilla and water. In a separate bowl, combine flour, cinnamon, salt and baking soda and stir well. Stir flour mixture into butter mixture, then stir in oats and pecans. Scoop out a rounded tablespoon of dough for each cookie, spacing them about 3 inches apart. Use a dampened spoon to flatten each cookie to about 2 inches in diameter. Bake 12 minutes or until golden. Cool for a few minutes before carefully removing from the parchment paper to a rack. Cool completely. For chocolate chip oatmeal cookies: Add 2 cups chopped dark chocolate or chocolate chips. When made with a heavier cup (140 grams) of flour, the cookies are slightly cakier. If you measure the 1 cup of flour with a light hand or weigh out 127 grams on a scale, the cookies are a bit chewier.